Abstract: The Carpathian-Pannonian region is one of the areas of Central Europe with good coverage of geophysical and geological data. This is due to its complicated evolution that attracted scientific interest already in the past. In addition, several international seismic experiments were conducted here in the last 10 years. The model to be presented uses most of these available data to perform a combined gravity–seismic interpretation. The analysis of the gravity anomalies is performed in order to identify the sources of the anomalies, separate their effects and localize the lithospheric inhomogeneities. The gravity stripped image of the region reveals significant differences in the nature of the Microplates ALCAPA and Tisza-Dacia from the surrounding regions. 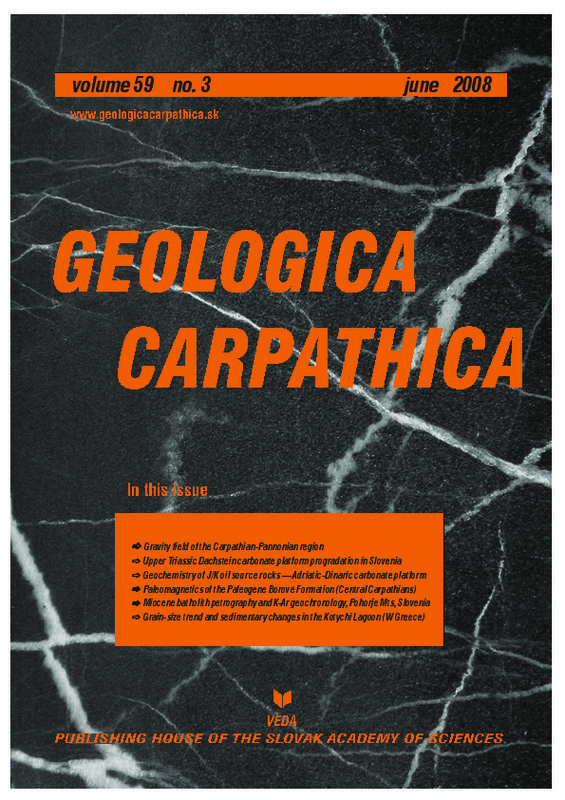 Abstract: The results of the paleomagnetic investigation from 9 localities of the Central-Carpathian Paleogene basal Borove Formation in the Liptov Depression (Central Slovakia) demonstrate complicated tectonic evolution in the central area of the Western Carpathians. The eastern rotations are predominant in the southern and western rotations in the northern margins of the Liptov Depression. Paleodeclinations vary from 92° to 269° and paleoinclinations from 7° to 59°. The dextral and sinistral fault systems explain different values of paleorotations in relatively closely situated localities. The obtained results generally support the model of tectonic escape from the south-west to north-east direction. Low inclination in some localities offers various explanations. Abstract: A series of K-Ar ages from the Alpine Pohorje Mountains igneous complex is presented. The granodiorite with dacite was emplaced in a dynamic environment in the form of a single major intrusion, between 19–18 Ma (Ottnangian), into still hot metamorphic host rocks. The granodiorite includes an older mafic portion of transitional diorite to pyroxenite composition, cezlakite, yielding an age of ~20 Ma. Granodiorite magmatism was followed by major tectonic activity causing uplift of the Pohorje Mountains complex, and the whole batholith cooled rapidly at rather shallow depths, yielding uniform cooling ages of around 16.7 Ma, at the Karpatian/Badenian boundary. The process was accompanied by the intrusion of minor rhyodacitic dykes in the north-western part of the Pohorje Mountains complex and of thin lamprophyre dykes mostly into the metamorphic rocks on the western margin of the pluton. The pyroclastics within the Miocene sedimentary rocks attest to the latter’s young age and subaerial emplacement conditions. In the final stage of the magmatism, aplite-pegmatite melts intruded into the solidified granodiorite. The Pohorje Mountains batholith represents the westernmost intrusion along the extensional structures of the Pannonian Basin. The main magmatic activity could be related to deep transtensional fractures of the Labot fault system north of the Periadriatic zone. The tonalite and granodiorite from the Pohorje Mountains are petrologically different and younger than the Oligocene tonalite from Zelezna Kapla (Eisenkappel), as well as the tonalites further west, and the tonalites buried in the Zala Basin in Hungary (roughly between 40 to 30 Ma), which belong to Paleogene Periadriatic intrusions. Abstract: The Kotychi lagoon is located on the northwest Peloponnese Greece, along a wave dominated and microtidal coast. The lagoon is one of the most important ecological areas in Greece, with international significance as it is protected by the Ramsar International Convention and is listing in the Natura (E.C.) Catalogue. For the present study 59 surficial samples were collected from the bottom of the lagoon, on a grid basis (approximately 300 m spacing) using a grab and were analysed for their grain size distribution as well as grain size parameters, mean, variance and skewness. Using the moment measures, grain-size trend analysis was made and the definition of trend vectors were estimated. Grain-size trend analysis indicates that the sediments of the lagoon are mainly sandy mud. Application of trend analysis indicates that the sediment pathways along the lagoon can be related to a) the sediments source area of the lagoon (small river supplies), b) wind related water circulation and c) the NW and SW wind directions. Moreover, comparing 1990 and 2000 satellite images we have detected three major areas where the shallow waters show a significant increase: area (a) in the northeast part of the lagoon, area (b) in the middle-west part and area (c) in the southern part. All these changes are related to river discharges and to the winnowing effect. Detection of changes in the coastline of the lagoon, showed a total reduction of areas covered by water by up to 13.8 %. The biggest change was detected in the northeast and in the southeast area of the lagoon and is related to the sediment supply from the periphery of the lagoon and to a minor degree to the bottom sediment pathway and winnowing effect. The rate of change of the area covered by water shows a rapid filling up of the lagoon and that additional measures have to applied for the protection of the lagoon ecosystem. Abstract: : A complete second-instar male larva of Nula sis gen. et sp.n., belonging to the cockroach family Blattulidae Vishniakova, 1982 is described from the Early Cenomanian amber of Sisteron in France. It reveals detailed and complete 3D morphology, with important presence of the central, 3rd ocellus, reduced in most adults and in all living cockroaches and termites, but present in some mantises. The modern distribution of unspecialized sensorial system of sensilla chaetica is also notable.